Hello readers of Oh, Sweet Joy! My name is Liz and I am thrilled to be guest posting for Handmade Monday. 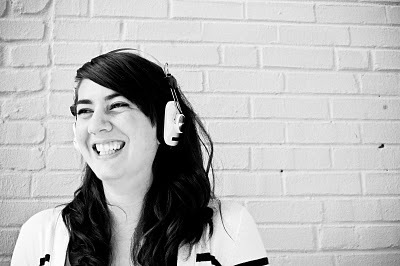 I write about music, fashion and DIY projects over at Dance to the Radio. I actually just moved to Denver from Philadelphia and have been working on several projects to decorate and organize my new home. I'm going to show you how I made a necklace holder inspired by a few different pictures from Pinterest. My boyfriend, Chris, is handy with power tools, so he helped out. 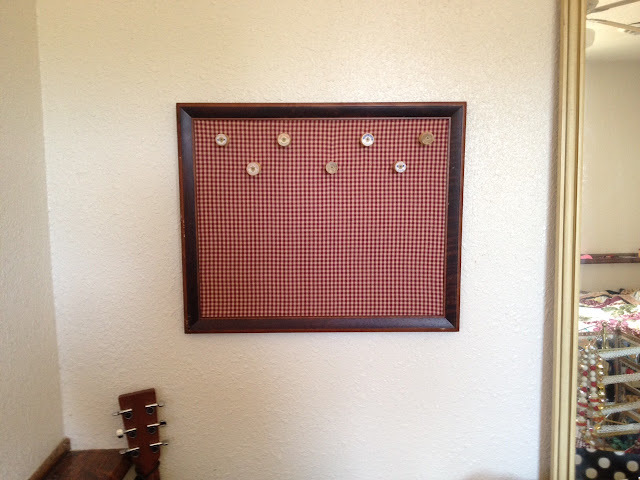 First, the supplies: A piece of plywood, a picture frame, screws, a power drill, a staple gun, fabric and vintage spools. Once you choose the picture frame, you will need to either find a piece of wood that fits in it or cut it to size. When the wood is cut to size, cover it with the fabric of your choice! Cut of the extra and use a staple gun to secure it. You can also try using hot glue. You're also going to be using the staple gun, or hot glue, to secure the fabric covered piece of wood in place as well. Once that part is finished, get your spools and lay them out where you'd like them to be. I chose a zig zag pattern so I could have a place both my long and short necklaces. 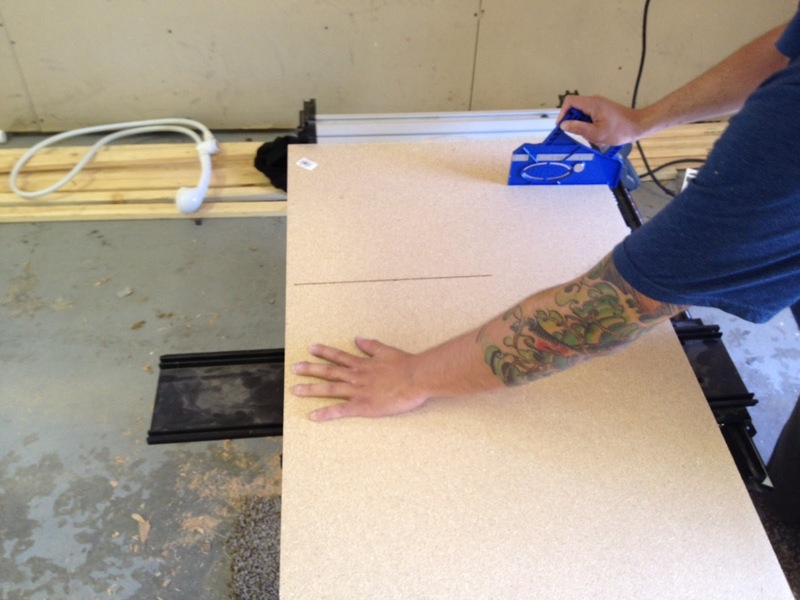 Once you are satisfied with their placement, use a power drill to secure. Hang this the way you're hang a picture - I used wire on the back of the frame. And you have your finished necklace holder! 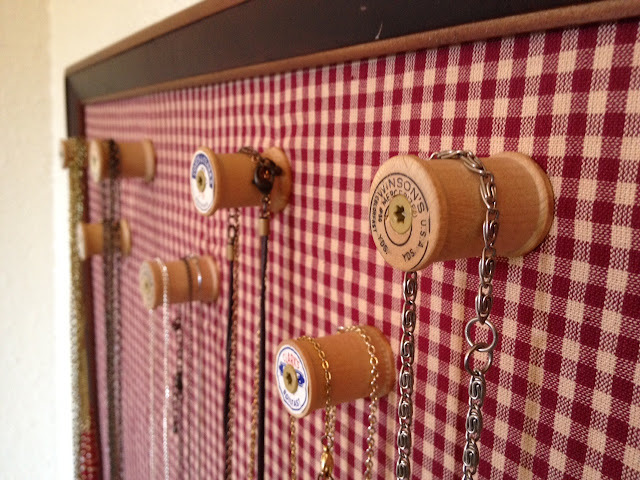 The last step, of course, is to hang your necklaces on the spools. I hope you enjoyed this! Please stop over to my blog and let me know if you try this out. Thanks Liz :) Happy Monday everyone! Hi Sinead! You could definitely make a version of this with just glue! A Denver blogger meet up would be a blast, Kim. Would love to meet you all. Great DIY Kim, love the finished product. Oops, I mean great DIY Liz! Very inspiring! So cute!!!! I need to stop throwing away all my spools!! Brilliant idea...gives me an idea for my girls for Christmas.